Each year hundreds of people volunteer their time and talent to help support WQPT Quad Cities PBS. This past year, one volunteer stands out from the others. 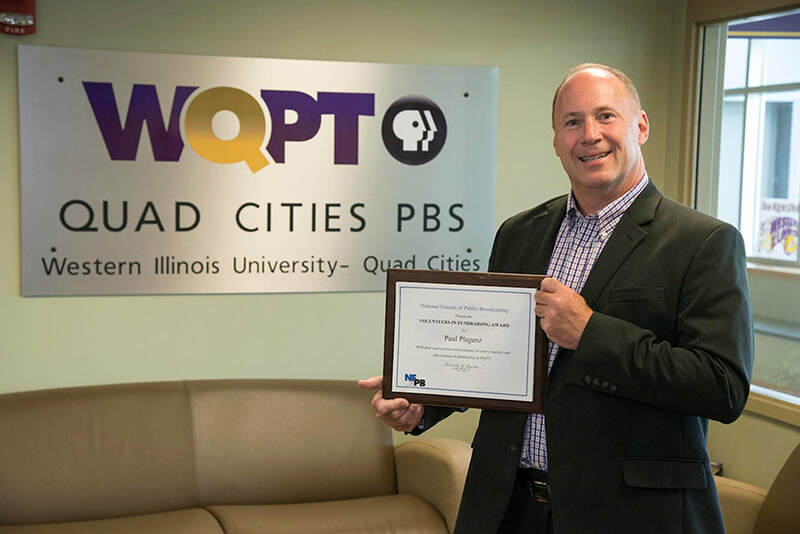 Paul Plagenz is the Director of Development for Western Illinois University-Quad Cities campus and WQPT is a public media service of the University. For the past four years, Paul has been an active volunteer with WQPT by serving on various committees, volunteering at events, mentoring development staff and is always available to give fundraising advice when needed. He not only volunteers his time and talent but is also a WQPT donor and attends many of the station’s fundraising events. Great development directors CARE and Paul is one of those individuals. He realizes that the social sector is always changing, and so are the ways that donors want to give. When he meets with potential donors for WIU he listens carefully to what they want. After many discussions with a donor, donating to the University may not be exactly what they want. So when he sees there may be an opportunity for WQPT he is the first person to open the door. Several times, Paul has been responsible for WQPT receiving significant gifts from donors he has met with. Last year, he was responsible for gifts to the station totaling $153,972.83. Currently he is helping with a bequest and will be assisting with WQPT’s upcoming Capital Campaign. Paul is a very upbeat, optimistic person and tries to do things that haven’t been done before in his professional and volunteer career. He understands that people invest in hope, and he provides the opportunity to others to make a real difference. Thanks to him he helped us meet last year’s financial budget goals. Paul is a true fundraising champion for WQPT and we’re lucky to have him as an advocate and a friend. Paul is featured on page 3 of WQPT's August program guide and on Western Illinois University - Quad Cities website!